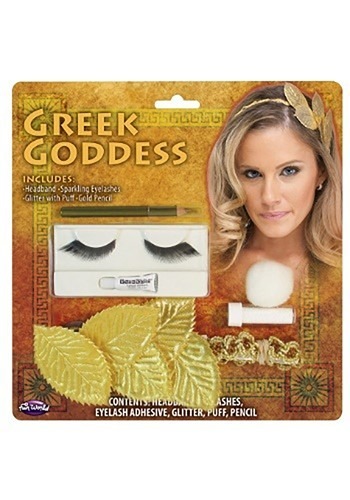 Luckily there's a way for any and everyone to coat themselves in gold thanks to the Greek goddess makeup kit. (The Gods must have heard our prayers! Thanks, Zeus and the crew.) We'd also like to mention, the kit is a lot less painful than the first example so all the kings and queens out there may want to continue reading. Stretch the shimmer gold leaf flower headband around your crown to start radiating from the top of your head. The eyelashes are also covered in twinkling golden sparkles and can be accented by dabbing glitter around the eyelids (also included.) The gold-hue eyeliner can be worn on upper and lower lashes to complete the gilded makeup look. You've got that golden glow so now just pick up a toga-style gown, warrior dress, or Grecian goddess costume to accent the beautiful makeup application.